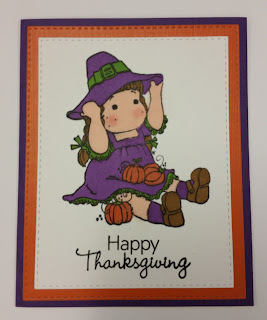 I made this Happy Thanksgiving card for the SendASmile4Kids box I'm sending off today. I'm a couples days late past the suggested deadline, but most of my cards are generally themed, so I don't think it will matter so much. I don't know the exact name of this Tilda image from Magnolia stamps, I either bought it from another blogger that was having a sale, or one it in a challenge. Anyway...I think she's a cutie, and I colored her up with my Promarkers, cut her & the orange frame behind her with a set of stitched rectangles, and then placed her on the purple colored card base. That Happy Thanksgiving sentiment is from a set I got ages ago from a My Creative Stamper fall set. Thanks for stopping by! I'm off to the post office! A very lovely Thanksgiving card. Such a sweet Tilda. Thank you for joining us over at Midweek Magnolias. Good luck! Your Tilda card is too cute, Patty. Thank you for sharing it with us at Midweek Magnolias.